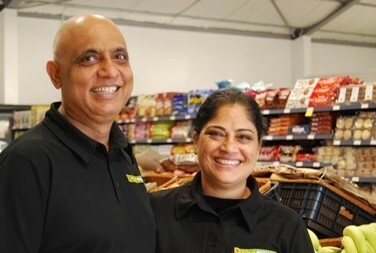 She and husband Satish, who will continue operating the couple’s Pirongia Four Square, were hard at work on last minute touches before tomorrow’s opening when Tamahere Forum called today. The fruit and vegetables were fresh in, the shelves stacked, the chillers and freezers getting their last minute additions from a team of helpers in a store that shone from its gleaming, polished concrete floor to a high, airy ceiling when the Forum called in. “We wanted a store that was a reflection of the surrounding community,” said an obviously proud Jassie. The couple bring to Tamahere eight years of experience of operating at Pirongia, another rural lifestyle community, but are keen to tailor this store to local tastes. Specialty and gourmet items including gluten-free, dairy-free, sugar-free and vegan are in stock and organic produce is in the pipeline. “We invite people to tell us what else they want us to stock,” said the couple who in recent years were named Sustainable Champions in Waipa and are bringing an environmentally-friendly approach to their latest store. Their distinctive Four Square delivery van is an electric vehicle (EV) and the couple, who live in Tamahere, will be working hard on waste reduction. The Parmars are also working to get a liquor licence, a process which couldn’t be completed in time for tomorrow’s opening. Tainui kaumatua Ken Rangitaawa will be blessing the store at 6.30am tomorrow before it opens to customers, who are invited to call in throughout the day. There will also be a ribbon cutting ceremony with officials from Foodstuffs, owners of the Four Square brand, mid-afternoon. The store is offering a range of opening specials and shoppers who spend over $25 will get a free jute bag and go into a draw to win a pizza oven. A very big welcome to Tamahere Jassie and Satish. You are bringing to our community a very needed service and we wish you all the very best. Many thanks for the best wishes for the store, we look forward to serving the great Tamahere community.